It Flies! Da Vinci's Dream Comes True : Krulwich Wonders... A team of German engineers have transformed carbon fiber, plastic, and other materials into machines that precisely mimic nature's designs. This is not a trick. There are no invisible strings, no post production video fixes. What we have here is a graceful, flapping, unfeathery machine that looks and flies like a seagull. 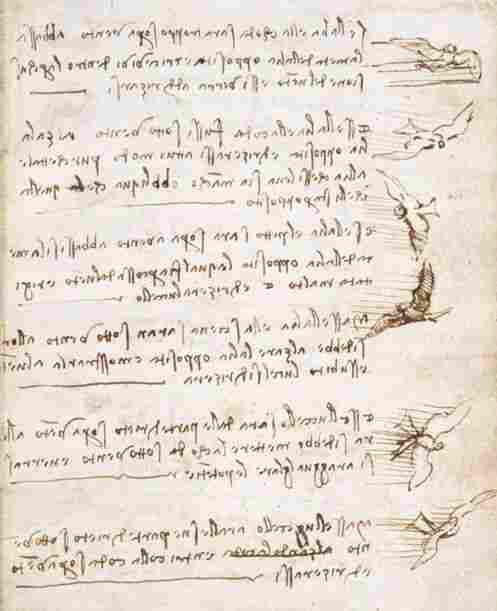 It was built by a team of engineers at a company called Festo in Germany, which specializes in factory automation, and for years now they've been doing what Leonardo dreamed of when he sat on those hills near Florence sketching birds: they copy from nature's designs. This newest little wonder is made of carbon fiber and plastic foam. It weighs a little over 17 ounces, with a wingspan more than 6 feet across. The engineers who built it, after a lot of ka-thunk, ker-plunk trial and error, can now put it on the ground and it will start flapping and take off on its own. Guided by a human using remote control, it was designed to look like a herring gull, one of those birds you'd see down at the beach. I don't know how well it does in wet or rough weather, but I did watch a video showing Chief Engineer Markus Fischer taking one down to a Baltic seashore where they let it fly with real beach gulls, and it stayed up there, and the other gulls didn't seem to notice or care. The breakthrough here was to design wings that torque and twist differently in many different places giving this machine more of the lift, propulsion and flight options a real bird would have. It's also astonishingly beautiful. So are their other inventions, which seem to pop out of this engineering firm annually. Last year, they created an automated elephant trunk that curled, twisted, stretched and grasped, and in one demo, daintily placed an egg into a researcher's hand. The Festo folks now have a zoo's worth of creatures: a water-based mechanical jellyfish called an AquaJelly, an AquaPenguin, an AquaRay, an air-born barracuda called an Airacuda. I've read that their next critter will be a bionic octopus. They also dabble in human body parts, mechanical arms, torsos, articulated hands. They have a Festo Humanoid. I don't know where they get the money, the time and the corporate permission to create these things (though I suppose defense research might be involved, I'm not too up on German corporate culture; maybe these explorations regularly turn into new industrial adaptations, I don't know). 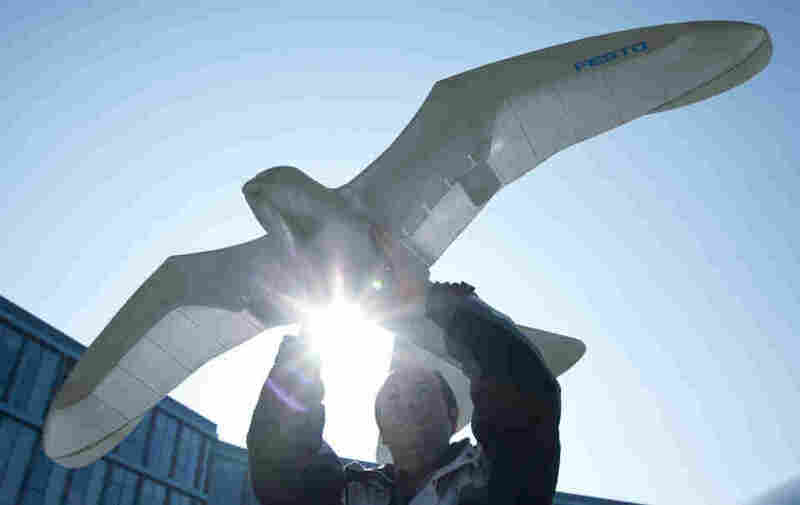 Mostly, I imagine the engineering team at Festo's Bionic Research Network as a lucky gang of Geppetto puppeteers who transform plastic foam and thin sheets of carbon fiber into closer and closer approximations of Pinocchio-like gulls, rays, penguins and elephants. Normally, such border bending projects make me nervous, but not these. These machines seem like celebrations of life.